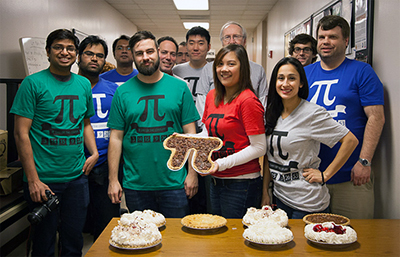 The University of Houston's Graduate Student Chapter of the American Mathematical Society, together with the undergraduate Pi Mu Epsilon Math Club and the Society for Industrial and Applied Mathematics graduate chapter, organized a Pi Day (3/14/15) celebration for the public complete with T-shirts and free pie., organized a Pi Day celebration for the public complete with T-shirts and free pie. Pi is a number equal to the nonrepeating decimal 3.1415926 . . . , and in addition to being the ratio of a circle's circumference to its diameter, pi appears in many disparate and surprising parts of mathematics and physics. The date of March 14 (i.e., 3/14) is known as Pi Day and used to celebrate mathematics and promote awareness of mathematics education. This year's Pi Day was particularly special because it was the "Pi Day of the Century" occurring on 3/14/15, a numerical abbreviation of the date that we will not see again until March 14, 2115.